Robots have always been based on nature and animals, and one fairly recent one, caught our eye. It’s a robot that is based on water striders, insects that can jump on water. Water striders themselves are awesome, they can skim along the surface of water but have also been created with the ability and intelligence to be able to launch themselves from the surface of water into the air. They know how much and how quickly to exert the right amount of force so as not to break through the water surface. Their legs are slightly curved and use a rotational leg movement to help them take off from the water’s surface. Now, a group of scientists from Seoul National University, Korea (SNU) have engineered a robot that does something similar. 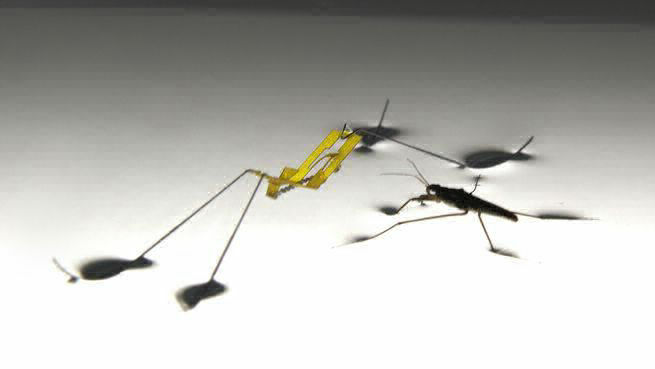 They have mimicked the movements of the insect and the robot that can exert 16 times its bodyweight onto the water surface, without breaking through. The way the robot jumps is similar to a flea, it has a lightweight catapult mechanism that uses a burst of momentum and thrust to propel itself off of the water. We’re not sure yet what its going to be used for, but its pretty cool in that it has shed some light on how water striders have such an amazing ability.